After a century of cold drizzle, spring is tentatively on the way, but winter isn't going to let go without a fight. If you feel in need of a pick me up, this simple but elegant cake is the one for you. Lemon, honey and thyme; that's basically a cold remedy right? I feel that Madeira cake is a bit neglected, but I always find myself returning to it. 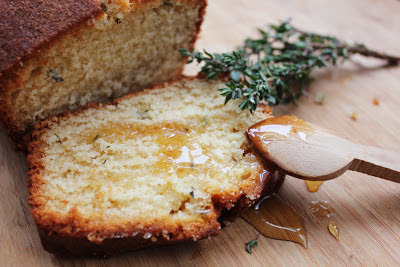 Buttery, rich and comforting, this one is spiked with lemon zest, fragrant thyme and honey for good measure (I've based the flavours loosely on Nigel's Slater's lemon and thyme sponge). If you're stuck for a Mother's Day treat to bake on Sunday (or have forgotten, oops), this here's a good 'un. Easy to whip up and perfect with a cup of tea and a cuddle on the sofa. Preheat the oven to 180C / 350F / Gas Mark 4. Grease and line a 900g / 2lb loaf tin. Cream together the butter and sugar until pale and very fluffy. Beat the eggs and pour a third into the butter mix, along with a tablespoon of the flour to stop the mixture from curdling. Stir well. Repeat with the other two thirds. Slowly sift in the rest of the flour and stir lightly until just combined. Add the milk a tablespoon at a time to keep the mixture smooth (it should have a dropping consistency). Zest the lemon into a separate bowl together with the thyme leaves and honey, and pound together into a paste. Stir gently into the cake mixture. Spoon into the loaf tin and smooth the top flat. Bake for around 40 minutes until golden brown and a skewer or toothpick comes out clean. Place the honey, lemon juice and thyme leaves in a bowl with a splash of boiling water and stir well to combine. While the cake is still warm, poke holes in the surface with a skewer and spoon over the syrup, so that it soaks in. Decorate with a sprig of thyme and a more than generous drizzling of honey. There's something brilliantly filthy about this photo. I know. It looks so... wanton. Nigel Slater uses plain and and a tsp of baking powder, but I generally use self-raising, just easier all round! Made this cake last weekend... It’s really yummy and it got me my best baking praise from my other half! This is gorgeous! My mum was very suspicious, but ended up liking it too! Glad you enjoyed, thanks for letting us know!